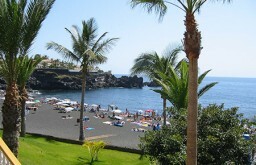 The popular coastal attraction of Playa de Las Americas Tenerife is a great place to holiday, and is near the south western tip of the island. If you are looking for year round warmth and sunshine along with an international atmosphere, then the Playa de Las Americas resort in Tenerife is the place for you. The resort boasts plenty of self catering apartments, villas for rent and world class hotels, along with a temperature that rarely, if ever, drops below 20 degrees. Small wonder that people from all over the world holiday at Playa de Las Americas each year. Playa de Las Americas is one of the most popular resorts in Tenerife, a volcanic island and one of the group of Islands known as the Canaries, Tenerife is still a province of Spain. If what you want is a thoroughly modern, cosmopolitan holiday resort, with a touch of old Spain thrown in for good measure, the Playa de Las Americas delivers on all fronts. Language won’t be a problem in Tenerife because English is spoken throughout the Island. The resort is practically next door to another popular Tenerife resort, Los Cristianos, which means you can enjoy all of the pleasures that both sites have to offer. When you tire of the crystal blue waters that lap at the white sandy beach, you’ll find plenty of nearby cafes and bars where you can stop for a drink on the way back to your accommodation. Getting to Playa de Las Americas couldn’t be easier as the resort is just seventeen kilometres to the south of the area’s major airport, Reina Sofia, with international flights to and from the airport on a daily basis. Once you’ve come through customs transfer by taxi or coach to the resort takes around thirty minutes. When you get to the resort you’ll find that there is plenty to do there, if you enjoy water sports there is canoeing, scuba diving and sailing, or if you prefer golf then you’ll be happy to know that the resort has an 18 hole course for you to conquer. Whether you go to the beach or the nearby water park, if you don’t feel like walking you can always take one of the free buses that will take you there. Many of the people who visit Playa de Las Americas in Tenerife, like to do some serious shopping while they are there. The resort has plenty to offer in the way of stylish shops and fabulous restaurants, no matter what your style or taste you are bound to find something to please both your eye and your palate. There is a wide range of fashion outlets as well as plenty of general stores and local supermarkets. In the evening you can stroll along the beach and stop at one of the many cafes or bars, or you can dress up, eat at one of modern style restaurants and finish up at one of the resort clubs or pubs. These are just some of the reasons why Playa de Las Americas in Tenerife is a great place to holiday.